LINCOLN, Neb. – In front of a sellout crowd of red, the No. 7 Florida Gators knocked off the reigning national champions, No. 2 Nebraska, 3-1 (25-20, 25-22, 23-25, 25-23). Before tonight's match, Florida was 0-3 in four-set matches against Nebraska and 0-3 in Lincoln, Neb., but changed that with the victory on Friday. Freshman Thayer Hall was the player of the game for Florida, coming up with 20 kills on 60 swings (.233). She also notched six digs and one block. The Gators finished with 49 kills as a team, hitting .182, and posted 59 digs in the win. UF was a powerhouse at the net, registering 10 blocks during the four sets. Florida got off to a quick start, winning the first two sets – 25-20, 25-22. The set was tied 8-8, but the Gators went on a 7-3 run to take a 15-11 lead and didn't look back from there. Hall recorded six kills in the first set and Marlie Monserez dished out seven assists to start the momentum. UF only garnered nine kills as a team in the second set, but it was enough to win the set 25-22. The game was neck-and-neck throughout, with the Gators largest margin coming at 21-18 and 25-22. Florida fell 25-23 in a tough battle during the third set, but Hall notched five kills in the frame and Holly Carlton recorded three blocks. The Gators came back in the fourth, registering 15 kills in the frame, hitting .317 as a squad. Taelor Kellum recorded four kills and Hall notched six, including the match-winner. After trailing 1-0, Florida never fell behind again, clinching their first victory of the season. Florida faces No. 3 Texas Saturday at 4:30 p.m. EST. The Gators hold a 15-9 series advantage over the Longhorns. 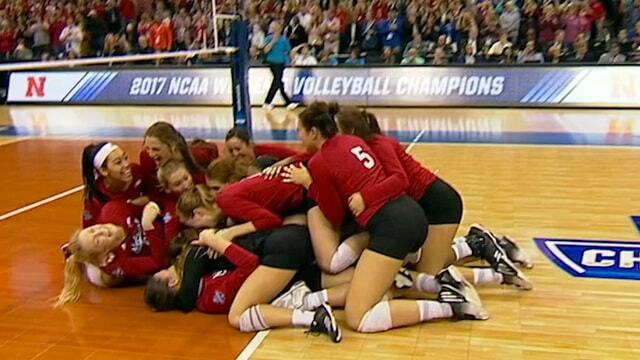 The match was the first time the Gators defeated Nebraska in Lincoln and the first time Florida defeated the squad in four sets. "It was a great performance overall tonight – coming in with so many new players and positions – it was great to see us compete as hard as we did. At the end of the day, it wasn't who played the cleanest, it was who scored the most points and we did that. There were so many great performances from the match to build on." "It was so exciting tonight – I think we matched the energy in this gym. Even though the yelling and the screaming of the fans wasn't for us, it still helped us tonight." "I was a little nervous to get the start tonight, but we have been working so hard in practice that I was confident going in. I knew that the team was there and I could look to anyone and feel a sense of calm." Thanks @vert for the video! "It was so awesome to be in a jersey again and to be with our family. It was an amazing atmosphere here and that is what we live for." "I can't do what I do, unless the players out there are doing what they are doing. We have an amazing defensive system and we passed so well tonight."